UPDATE: Unfortunately this promotion has ended but you can get $25 in credit by using our links below. AirBNB just launched a great promotion where they’ll give one night free (up to $300) to new members who verify their account. This is a pretty amazing deal! If you’re not familiar with AirBNB, it’s a vacation rental site where you can book people’s apartments, homes, bedrooms or even couches. 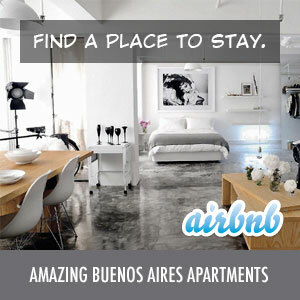 We’ve listed our Buenos Aires rental apartments there and used it numerous times when staying in New York City. Book by midnight on January 17 for travel starting before midnight on March 31. Stay 2 nights or longer. Enter the promo code ONENIGHT at checkout and one of the nights is free (up to $300). That’s it. AirBNB has over 4,000 listings in Buenos Aires alone, but if you have any trips planned to the beach towns – Cariló, Mar del Plata, Punta del Este, etc. – this could come in pretty handy. Of course they have listings in pretty much every city, so if you don’t have any plans maybe you should make some now! *The discount is valid only for guests who have never completed a booking on Airbnb. To receive the discount, you must book via the Airbnb website with promo code ONENIGHT and successfully complete Airbnb’s Verified ID process prior to booking. You must complete a booking (including host acceptance) using the code between 12:00am PST (California time) on January 13 and 11:59pm PST (California time) on January 17. The discount applies to one night of your stay up to a maximum of USD$300. The cost of “one night” is calculated by averaging the base reservation rate for each night, excluding taxes or other fees charged by your host, such as cleaning fees. Your stay must be at least two nights in length at the same listing, and must begin no later than 11:59pm PST (California time) on March 31, 2014. Limit one discount per new user. The offer is valid for a single use and is not transferrable to another user or redeemable for cash. If your booking later qualifies for a refund, the maximum refund you may receive is the amount you actually paid. The code cannot be used for bookings made through Airbnb’s mobile apps. The code may not be combined with another Airbnb coupon or discount code. Host payouts will not be affected by permissible guest use of the code. Airbnb reserves the right to any remedy, including denial of the discount or cancellation of your account or reservations, if fraud, tampering, violations of Airbnb’s Terms of Service or technical errors are suspected.